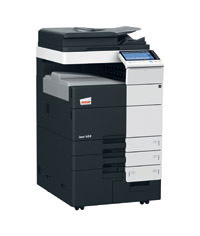 The Develop Ineo +364e is also available as the Konica Minolta Bizhub C364e and Olivetti d-colour MF-362 Plus. Exactly the same machines, just different badges on the front door. For the sake of that badge the Develop version will normally save you money and qualify for some free pdf software at the same time.